We’ve come here today to announce a brand new Event Type: the Duel Decks. In this completely new Event type for both new and older players alike, you will pick a side and fight for its victory. Each Duel Decks is a mini-collection with a varying amount of new cards obtainable through gameplay and for the duration of the event in the Vault. This Event type is divided into three Phases and is intended to last 2~3 days. Here are the Phases: the Challenge, the Duel and the Final Duel. It is also the first event that is both a mix of PvE and PvP. There are 2 nodes (one for each side). Each node has a Fixed Planeswalker and Deck. Each node has 3 objectives and no charges; meaning you can play them as much as you want! Whenever you beat Objective 1 you will unlock Objective 2. Once you beat Objective 2 you will unlock Objective 3. Beating the Objective 3 will unlock that side so you can use them in the next 2 Phases. The secondary objectives are achievable only once. Once you clear all objectives in a side, you will get to fight for that side once the Duel Phase has started. If you clear all objectives in both sides, you will be able to choose for which side you want to fight for. Finally, players who don’t have the cards of the necessary color to compete for that side in the Duel Phase: rest assured, you will get a small bundle of cards that will get you started in defending the side you chose upon clearing the 3 Objectives. We want players, new and old, to have fun with the new cards. It also allow us to show players our own take on some older mechanics (in case of Duel Decks that relate to older collections like Zendikar). There is a single node. You must choose the side you wish to play in that node. The node has a Fixed Planeswalker (the one you chose to fight for). You can build any deck you want with that planeswalker. As long as you follow the Node/Planeswalker rules. Each node has 3 objectives! The Node Objectives are much like the regular PvP objectives. All three are available from the get go and completing them will yield you a great reward! Each match you play and win contributes to the side you chose. The final stretch of the Duel is the Final Duel Phase. Players will be able to see an updating clash bar that shows how close their side is to victory! The reward structure in this Event type is very simple. Players will earn their rewards while playing and completing objectives. Players will also earn rewards based on whether their side won or lost. To gain these rewards you must choose and play at least 1 match for the side you chose. The winning side will always earn the Exclusive card for their side as well as an amount of each currency and a Duel Deck Booster Pack. The losing side will always earn some amount of each currency and a Duel Deck Booster Pack. These are non-duplicate packs of a single exclusive rare out of a pool of rares. These are available for anyone participating in the event. These are non-duplicate packs of a single exclusive mythic out of a pool of mythics. These can only be purchased after the player has completed the objectives in the event that are related to that side. These are special exclusive planeswalkers that can only be acquired during the event. This content is Legacy-legal. Meaning that you will be allowed to use these cards in every Legacy Event. The team here at Oktagon wanted to release a new event type close to our 1-year anniversary as the developers of MtGPQ. We also wanted it to be something exciting that the entire community could join in. A long-time request of veteran players is to have events that reflect tabletop MtG’s supplementary products (Planechase, Commander, etc…), so we moved towards adapting one of those as the new event type. We also wanted it to be accessible. Out of all supplementary products the one that presented itself as a great way to introduce players to the community was the Duel Deck model: two predefined decks that present a complete and interesting experience to new and veteran players alike when played against each other. We also wanted players to be able to participate at least, in some way, if they were not PvE-only or PvP-only fans. PvE fans can explore both sides and still play the PvE nodes for the entire duration of the event. PvP fans need only to complete the objectives of the side they wish to represent in the PvP Phases. Finally, to tie it all up: the reward structure. It is tier-less and coalition-less so that players, with small or large card collections, can feel motivated to participate and (re)join the community. Keep in mind that, in order to keep delivering content, these changes will be made slowly. However, in time, they will get done. 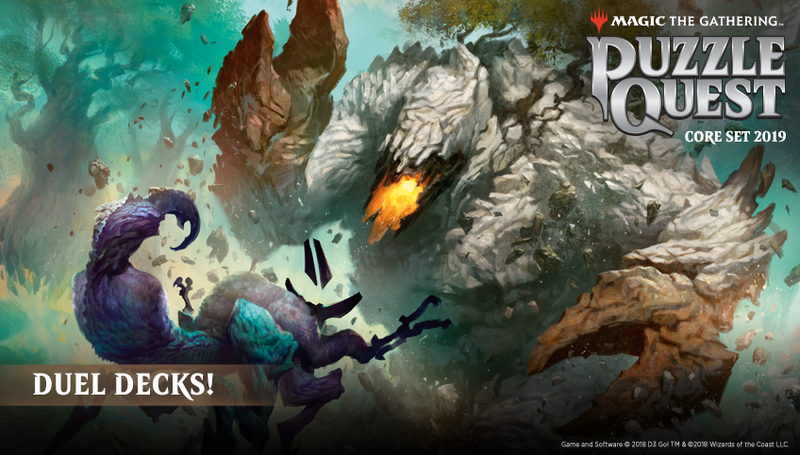 We here at Oktagon are always thinking on how to bring exciting new content and improvements to MtGPQ and we hope you enjoy our very first new event type. Like what you hear?! If so, we are going to try something new here that we haven’t done this wide before. We would like to invite you to a Beta Test for the upcoming Duel Deck Event. Please head over to our Google Form and give the details a read. Please note, not everyone will be selected and there will be three runs of the Beta Test. Once the Beta Test is complete, we hope to make the new event live for everyone in mid-October. We thank you for your help and we hope you enjoy the new event!